Rent a bike in the Pyrenees. Running from Saturday July 7th to Sunday July 29th 2018, the 105th Tour de France will be made up of 21 stages and will cover a total distance of 3,329 kilometres. The 2018 Tour de France will include a total of 25 mountain climbs or hills and altitude finishes ranked in second, first of HC class. 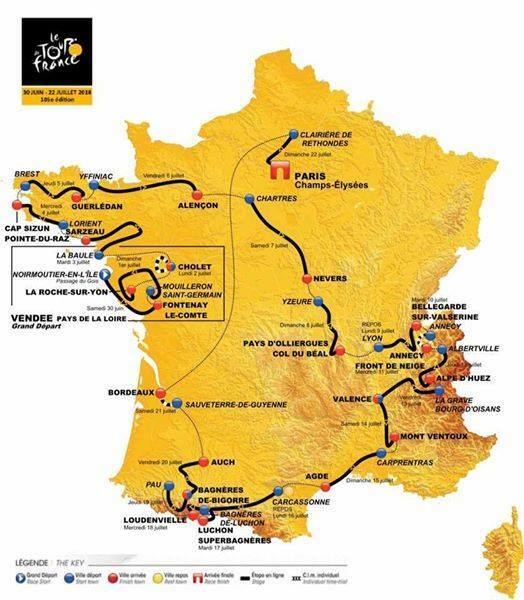 2018 Tour de France Route Rumours. The 2018 Tour de France will start in the Vendée region in western France. The race should then proceed north to Brittany, where it will use some of the dirt roads featured in Tro-Bro Léon. There should also be an uphill finish on Mûr-de-Bretagne. It will then cross France towards Roubaix where some pava will be encountered. Than a transfer to the Alps for week 2 and the Pyrenées in the last week, finishing in Paris on Sunday 29th July 2018. Wednesday 25th July 2018 Luchon Pla d’Adet ??? Your dates are a little out of whack. You have two 5th July which means that Bastille Day is on the wrong day and you miss 21st July! I have good info that 2018 will feature Time trial on Alpe D Huez. You heard it here first! Please cite your sources. APA format only. You better send an email to ASO and UCI as they seem to believe that their race starts on 7th July 2018. The date was originally announced as 29th June but has been changed to 7th July. Interesting, but hardly accurate. The basic outline of the route is about right. Col du Béal I have heard mentioned several times. l’Alpe d’Huez, yes. Ventoux? In the Pyrenees a return to Superbagnéres has been rumoured for the last 2 years. I think there is a lot of support for that from the local politicians who control the purse strings. After that, Luchon to Pau, a classic route followed by Pau to a mountain top finish in Vallee des Gaves (Hautacam, Luz Ardiden, Couraduque, Gavernie?). Bordeaux will host the Tall Ships at the end of June 2018. The mayor has said there is no money for Le Tour but that he would like it in 2019 or 2020. Hello. What’s your source for a stage in Verdun ? No source. Like everything else on this page it is just rumour and should not be taken seriously. Rethondes to Verdun is about 200km and Le Tour will be heading in that general direction. Amiens to host finish on 14th July. Narbonne is mentioned for the second restday. 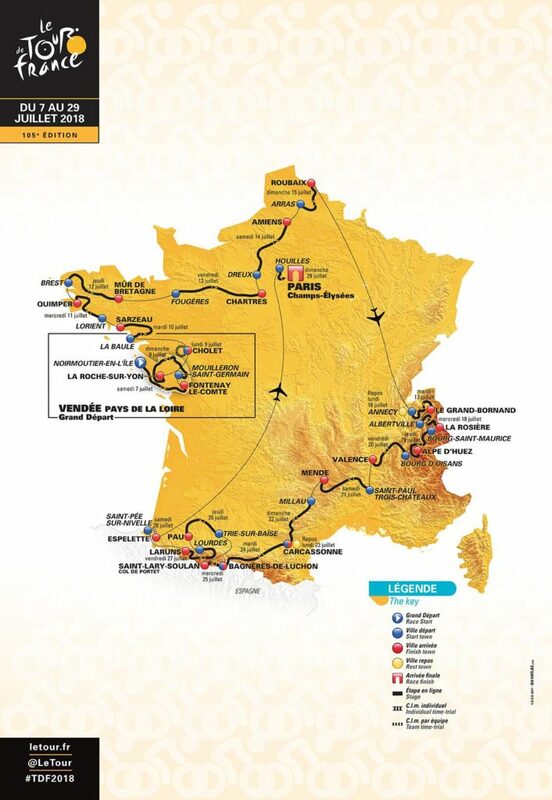 It is likely that the stage starting from Millau will finish in the region. Someone mentioned that the route would be near area 50 on Manche at some stage. This is Granville, Coutances, Avranche, Villedieu. The person said they would like to come over and stay with us. I cannot see it anywhere near this area, But then I am not good at reading maps. Second rest day in Carcassonne on 23rd of July. any clue as to where the Etape will be in 2018? It hasn’t been in the Pyrenees in almost 4 years. Does anyone know when the exact routes will be released? I am going and would like to know where to camp out for some of the stages.